The importance of ergonomics in your workday. When we talk about ergonomics, what do we actually mean? Relating to or designed for efficiency and comfort in the working environment. So when introducing a standing desk to your workday, it’s vital that you have the correct ergonomic setup so that you can work efficiently and comfortably. This would mean you have a set up that allows you to be the most productive you can be. Seems pretty simple right? Yes, so long as the design of your standing desk allows for it. 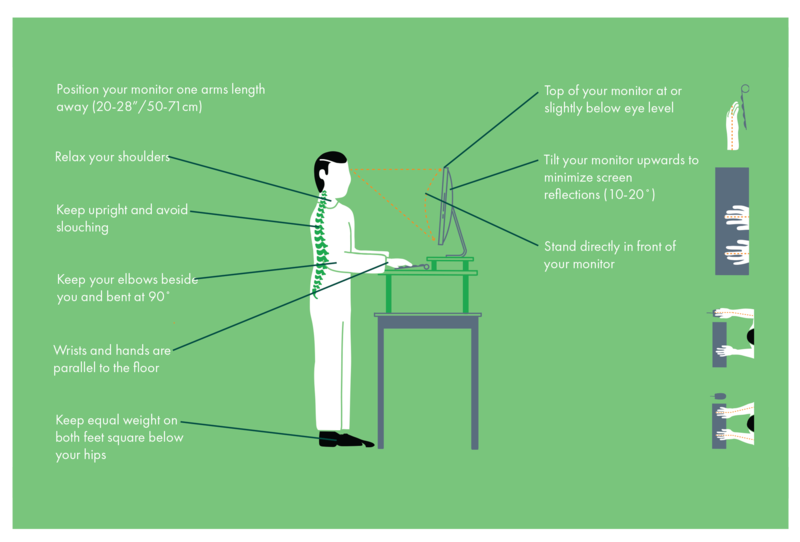 We go into the guidelines for choosing a standing desk in our Blog: The 'HOW TO' guide: Choosing a standing desk that suits you. In the meantime, we'll take you through some guidelines to get you up and running and feeling comfortable using your current setup. Click the graphic below to see our visual setup guide. As a final note, even with the correct ergonomic setup, you may still experience aches or muscle fatigue if you maintain a static posture for a long period of time, particularly when you start out. This can be associated with strengthening muscles that you aren’t used to using. Keep moving as much as possible and alternate your posture between sitting and standing throughout the day to feel productive, focused and comfortable.